Your Purdue master’s experience will shape more than your career path – you’ll cultivate your approach to leadership, problem solving, global cognizance, and self-reliance. 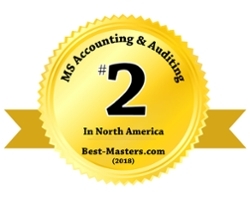 Our Master of Science with a concentration in Accounting program is ranked #2 among North American MS Accounting and Auditing programs by Eduniversal. The program is designed to help you achieve fulfillment in your career, wherever your dream job may lead you. Our 10-month program is specially designed to enable you to tailor your master’s experience to fit your career goals. The lifetime career earning potential for graduates with an MS Accounting degree holders versus those with a Bachelor's degree is estimated at $500,000. This makes an MS Accounting degree an exceptional investment for accountants. Krannert's MS Accounting programs offers exceptional return on investment with one of the most affordable tuition rates available. Whether you want to pursue a career in public accounting, consulting, or within industry, the flexibility we offer allows you to get the graduate-level educational experience you need to be successful. Pair this with the ability to pursue CMA certification throughout your studies and readiness to take the CPA exam immediately upon graduation, and you’ll appreciate the significant value in this one year master’s program. Recent graduates have experienced an 82% first-time pass rate on the CPA exam section, which is well above average. Now offering Fall admission (begin in August) OR Spring admission (begin in January). Choose the option that suits you best! Follow Us on LinkedIn at Accounting at Purdue University where we share news and information. Purdue's Accounting Professor Troy Janes was selected as the academic representative on the American Institute of CPA's twelve person sponsor advisory group to develop a new version of the CPA exam. He is now on the Auditing and Attestation Subcommittee, which is responsible for the content of the Auditing and Attestation section of the CPA exam. Thank you for visiting the MS Accounting website! Would you like more information, or do you have a question for our MS Accounting team? Would you like to be updated when we have important updates or information about the program? **Your contact information will only be used to contact you by a representative from the Krannert School of Management. Your privacy is important to us, and we will not sell your information to any 3rd parties.